I’ve long admired eye miniatures from the 18th Century. These ‘Lover’s Eye’ miniatures were often made into brooches, pendants or rings and given as love tokens. They ooze mystery and intrigue, tantalising the viewer into guessing the identity of the secret lover, although many miniatures were probably simply a form of sentimental or mourning jewelry. See a good selection of Lover’s Eye brooches here on Pinterest. ‘Secret Sitters’ is my homage to these brooches, but I have decided to present them on antique and vintage books instead. I have a variety of books in stock. 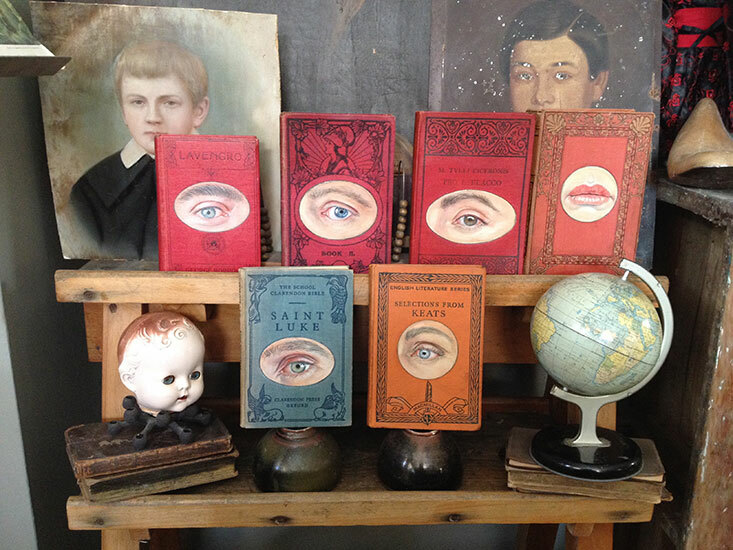 If you wish to commission your own Secret Sitter miniature (eye, nose, mouth or ears! ), please request to see my current stock and choose your preferred book, then just simply email me a good quality (in focus) close-up photo of your loved one’s eye. Alternatively, send me the book you wish me to paint on. Email me an image of it first though, so I can see if it is suitable (e.g. it can’t have any embossing on the area you wish me to paint). The perfect wedding, Valentine’s Day, birthday or Christmas gift. What a truly delightful gift idea ! I have just emailed you an idea for something based on this, Amanda, I hope you can help, I am feeling inspired by your vintage work. Thanks Bob 😀 Looking forward to working on this project.